Back to southeast Brooklyn, in today’s post. Last week, I described taking a trip “back home” to the south eastern section of Brooklyn which spawned me. My ultimate goal for the trip involved a visit to the NY Aquarium, described in this post, and then I set off to the east in the direction of Brighton Beach where I seem to have found Nemo. As mentioned in the two prior posts, having spent a good amount of time on the Q, or Brighton, line traveling here from Astoria in Queens – I wanted to maximize the time spent and decided to head over to Sheepshead Bay. At the head of the Bay, my first visit was to the Holocaust Memorial. The park originally consisted of a grove of established London plane trees (destroyed by Hurricane Sandy in 2012 and since replanted) and a seating area which formed a contemplative space beside the water. 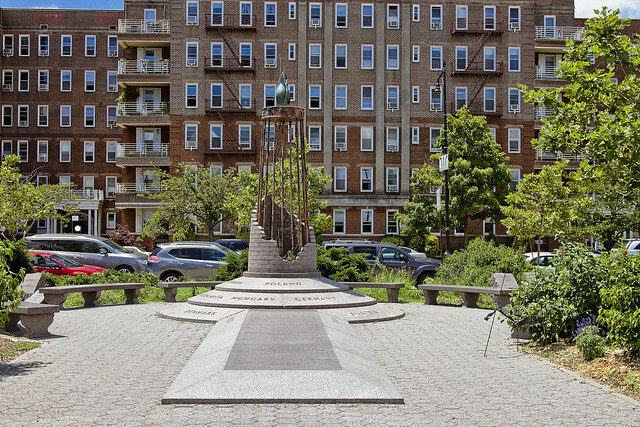 After a lengthy planning process led by a local non-profit organization, the Holocaust Memorial Committee, Brooklyn Borough President Howard Golden allocated $933,000 toward construction of a permanent memorial designed and built by the City. 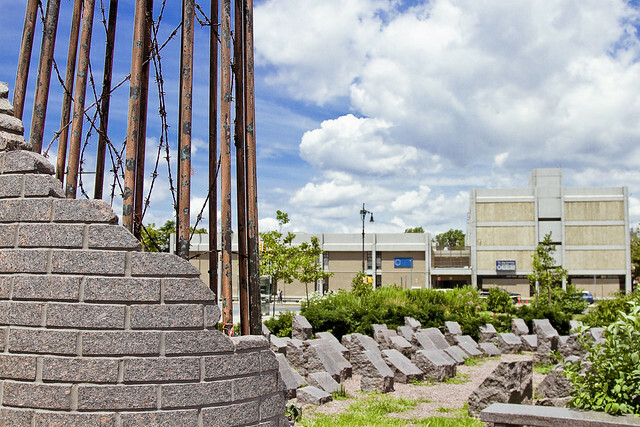 Holocaust Memorial Park was dedicated on June 22, 1997 by Mayor Rudolph Giuliani. Having grown up in a Jewish neighborhood, and family, it was kind of normal to see people with non-ironic tattoos on their arms who were survivors of the Second World War’s death camps. In my peer group, it was actually fairly common for many of these folks to be my friend’s parents or grandparents. Sheepshead Bay has, if anything, become even “more Jewish” in the years since I left this area, no doubt due to the huge number of Russian Jews who have emigrated here in recent decades. Accordingly, there’s a Holocaust Memorial Park at the head of the bay. 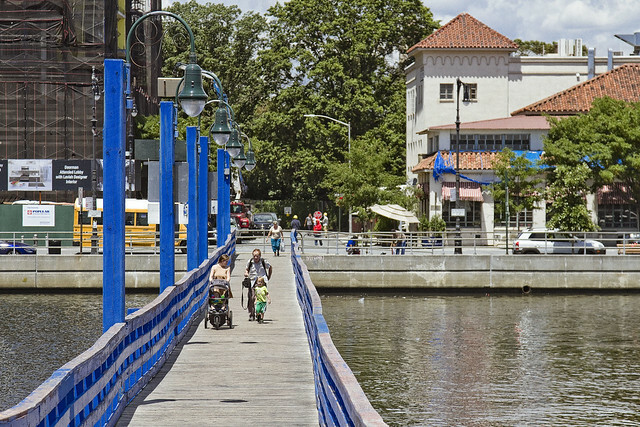 The name “Sheepshead Bay” applies to the neighborhood north of the bay as well as the bay itself. 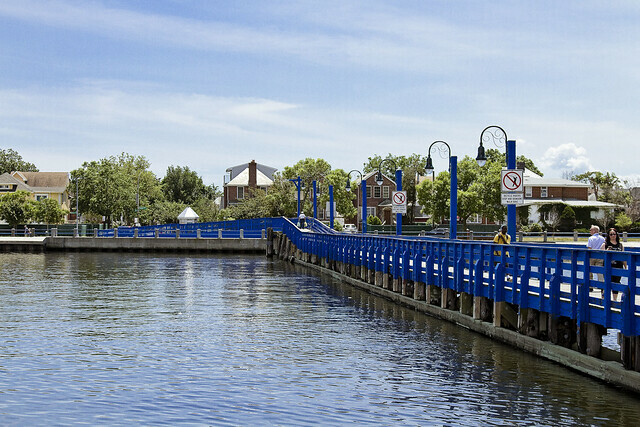 Sheepshead Bay was named for the sheepshead, an edible fish found in the bay’s waters. The fish, now rare, can still be caught in the local waters occasionally. The bay itself was originally the easterly entrance to Coney Island Creek, but the filling-in of the central part of this waterway during the 1930s, in conjunction with construction of the Shore Parkway portion of the Belt Parkway, eliminated access to that waterway. At the same time, the bay was widened, deepened, and bulkheaded at its western end. Recreational fishing fleets are now located there, though the fishing fleets have been shrinking every year and are being replaced by dinner boats. 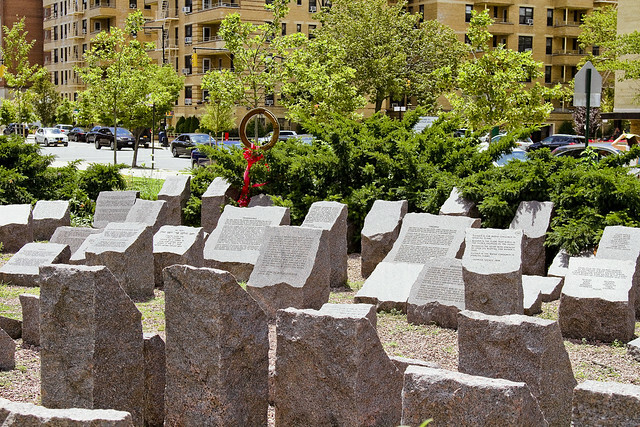 Holocaust Memorial Park, located at the western end of the bay, is used throughout the year for commemorative events. It’s actually a pretty nicely thought out sculptural installation that conveys a revenant vibe, and it is tellingly devoid of graffiti. Actually, one of the things I noticed about the modern version of Sheepshead Bay is that there was comparatively little graffiti on the walls. Even under the subway overpasses. This is a marked change from what it looked like when I was a kid. If the “old rules” of this section of Brooklyn still apply, it would indicate that there’s high ranking figures in the local underworld who have let the neighborhood know what will and will not be tolerated and that “street art” ain’t one of them. When I was a kid, this figure would have been somebody of Italian ancestry, whereas today it is likely someone of Russian or Ukranian birth. 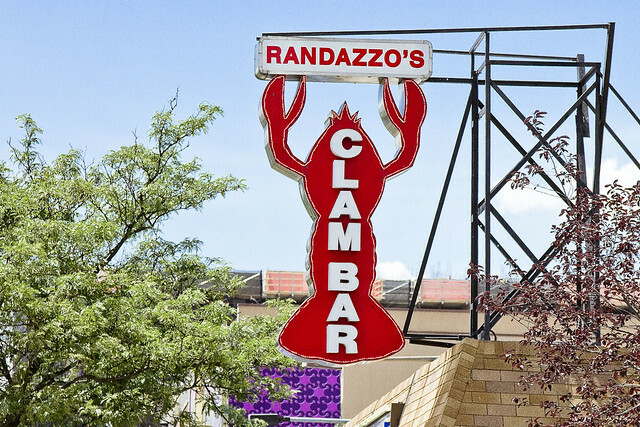 I wasn’t at Sheepshead Bay to muse about the provence of the local Organized Crime families, nor to contemplate the Nazi regime and the consequences of their policies – instead I was here to revisit some of my old haunts and check out how the place was doing. The western inlet of Coney Island Creek extends eastward from Gravesend Bay to Shell Road. The path of the landfill follows Shore Parkway, Guider Avenue, and the triangular block between Neptune Avenue and Cass Place. 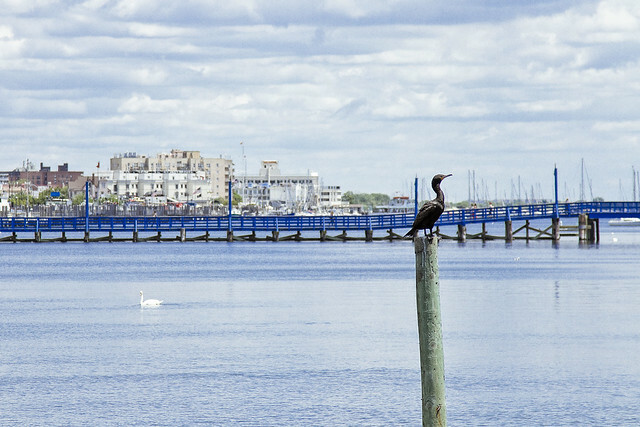 The eastern inlet picks up at Shore Boulevard and gradually widens into Sheepshead Bay. Sheepshead Bay was once part of the Coney Island Creek tidal strait – which seperated a sand bar barrier island – which today hosts the neighborhoods of Manhattan Beach, Brighton Beach, Coney Island, and Seagate – that was isolated from Brooklyn, which is actually on Long Island, and was called “Coney Island.” Coney was a proper island until Robert Moses came along in the 1950’s and turned it into a peninsula, separating Sheepshead Bay from the western section of Coney Island Creek with landfill, in pursuance of building out Shore Parkway and what we now call the Belt Parkway. This section of the “House of Moses” is connected to the larger Jamaica Bay water system, which is absolutely teeming with all sorts of critters. Jamaica Bay is located on the southern side of Long Island, in the U.S. state of New York, near the island’s western end. The bay connects with Lower New York Bay to the west through Rockaway Inlet and is the westernmost of the coastal lagoons on the south shore of Long Island. Politically, it is divided between the boroughs of Brooklyn and Queens in New York City, with a small part touching Nassau County. 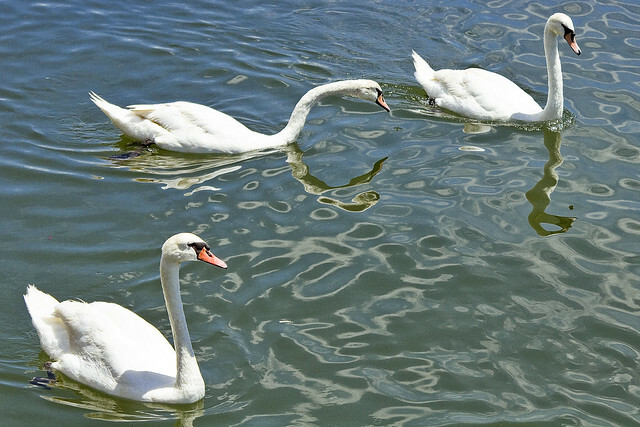 Sheepshead Bay is fairly infested with Mute Swans. I believe they’re mute swans at least, (I’m no ornithologist) which are actually an invasive (anthropogenically introduced) specie native to Asia. You can tell what they are because of the orange bill. Trumpeter Swans, which are actually a native specie to North America, have black bills. They’re the Royal bird of the British Crown, which employs a “Royal Swanherd” to care for them on the Thames. I didn’t see, nor have I ever heard of, anyone in Sheepshead Bay who might be described as a Swanherd. The English word ‘swan’, akin to the German Schwan, Dutch zwaan and Swedish svan, is derived from Indo-European root *swen (to sound, to sing). Young swans are known as swanlings or as cygnets; the latter derives via Old French cigne or cisne (diminutive suffix -et “little”) from the Latin word cygnus, a variant form of cycnus “swan”, itself from the Greek κύκνος kýknos, a word of the same meaning. An adult male is a cob, from Middle English cobbe (leader of a group); an adult female is a pen. 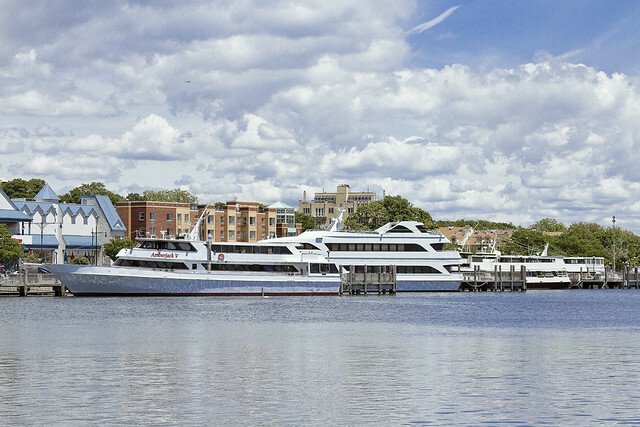 The northern side of Sheepshead Bay follows Emmons Avenue, and that’s where you’ll find the big commercial docks as well as a series of restaurants, bars, and attractions. More on that in a minute, however. Shore Blvd. is on the tony Manhattan Beach side. Manhattan Beach hosts homes that are near mansions, and on its eastern tip you’ll find a nursing home and CUNY’s Kingsborough Community College. As an aside, when I was in high school back in the 1980’s, we referred to Kingsborough as the “12 and 1/2th grade” but I understand that they’ve really stepped up their academic standards since. Connecting the two sides of the bay is the Ocean Avenue Bridge. Now, a bit of personal backstory is required for this. My mother was terrified by many things. Elevators, African Americans, air conditioning, dogs, bees, flocks of passing birds – she was actually convinced that electricity could shoot out of the wall sockets if you didn’t put little plastic plugs in them. The largest resovoir of her irrational estimates of risk, however, always involved the water. She would be rendered catatonic if she was around today and found out how much time I spend on boats, shorelines, etc. Catatonic, yes, but she would still likely be yelling at me about something. What can I say, the rumors you’ve heard about Jewish Mothers are actually kind of understated. On the “pain of death” thing, for those of you under the age of thirty, it used to be pretty much assumed by kids that their parents possessed the legal right to murder them under the “I brought you into this world, I can take you out of it” rule. The bridge has a very old pedigree: it was first opened by Long Island Rail Road king Austin Corbin in 1880, and after a few false starts (Corbin kept closing the bridge since he thought “undesirables” would frequent his development, then-exclusive Manhattan Beach) there has been a pedestrian bridge here almost continuously since. It’s called the Ocean Avenue Bridge, even though it’s a block west of Ocean Avenue on the north side. 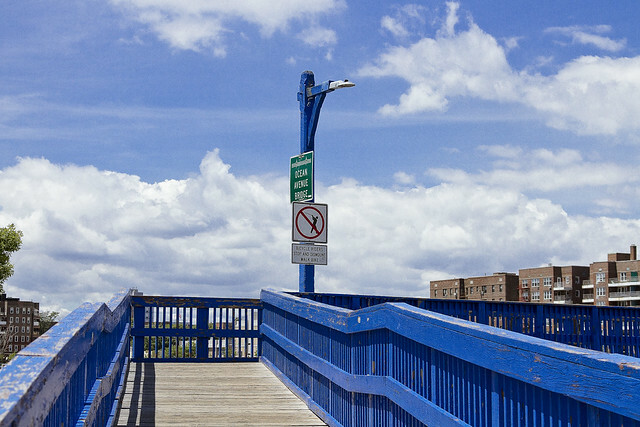 It was with my last remaining ember of adolescent rebellion that I walked up the ramp to Ocean Avenue Bridge and headed across the water towards Emmons Avenue. Take that mom. Despite the spectral admonitions offered by a cranially contained inner voice which I refer to as “Mom,” I actually found the bridge to be in a fairly good state of repair. One did not fall into the water. 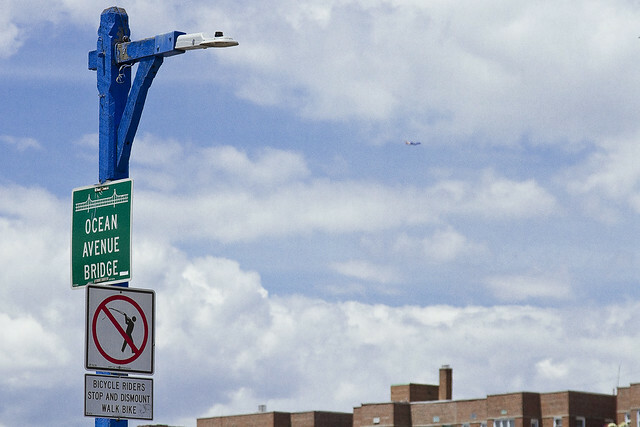 Turning onto Emmons, I began to notice how much things had changed around Sheepshead Bay since the old days. Whole sections of the waterfront were completely changed, and most disturbingly, the bar I used to go to in high school that did not ask for proof of legal drinking age was gone. Of course, the bouncer at this particular bar – for a certain interval between 11th and 12th grade – was sometimes none other than Andrew Dice Clay. That’s the neighborhood that I’m from, btw, for those of you know me in real life and think my behavior or speech patterns overly direct, confrontational, or not “politique” enough. As I often say, I grew up in “Brooklyn” Brooklyn where the only thing “artisanal” you might encounter was a beat down – if you were lucky enough to have encountered an assailant who was only using his hands rather than bricks, bats, or garbage can lids. Happily, though, some things on Emmons Avenue were exactly the same as they were the last time I was here, which reflection reveals as being more than two decades ago. More tomorrow. with NYC H2O. Click here for more details. with Open House NY. Click here for more details. with Atlas Obscura. Click here for more details. Shortly after leaving the East River Ferry at 2nd street in Long Island City the other day, and having found a convenient and quite well hidden spot to urinate upon (scent marking my territory should another photo blogger happen by), a general flurry of photography was undertaken. My practice these days is to limit myself to just two or three shots of any particular subject, randomly encountered, yet despite this rule- so many interesting things were happening all around me on the walk back to Astoria that I ended up cracking out nearly 300 shots in just a couple of miles. One in three ended up making it into the permanent collection, and around half of those ended up at my Flickr account. It was down in DUPBO, Down Under the Pulaski Bridge Onramp, that I first noticed something out of the ordinary. Scent marking (also known as spraying or territorial marking) is behavior used by animals to identify their territory. Most commonly, this is accomplished by depositing strong-smelling substances, sometimes by urinating on prominent objects within the territory. Often the scent contains carrier proteins, such as the major urinary proteins, to stabilize the odours and maintain them for longer. These shots will look a bit rough, as I was armed only with short lens, rather than the sort of telescopic unit which would provide for a longer optical reach. 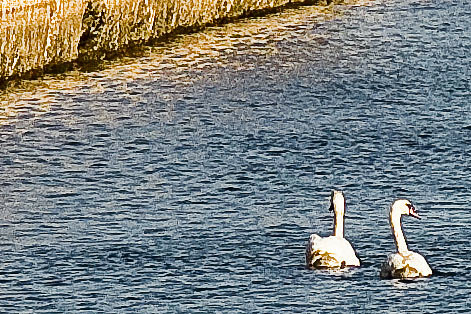 Normally these wouldn’t pass the QC test and be presented to you lords and ladies, but on this particular day in early April- a pair of Swans were plying the waters of the Nations most polluted and highly industrial waterway. Such an occurrence requires some comment. Many of the cultural aspects refer to the Mute Swan of Europe. Perhaps the best known story about a swan is The Ugly Duckling fairytale. The story centres on a duckling that is mistreated until it becomes evident he is a swan and is accepted into the habitat. He was mistreated because real ducklings are, according to many, more attractive than a cygnet, yet cygnets become swans, which are very attractive creatures. Swans are often a symbol of love or fidelity because of their long-lasting, apparently monogamous relationships. 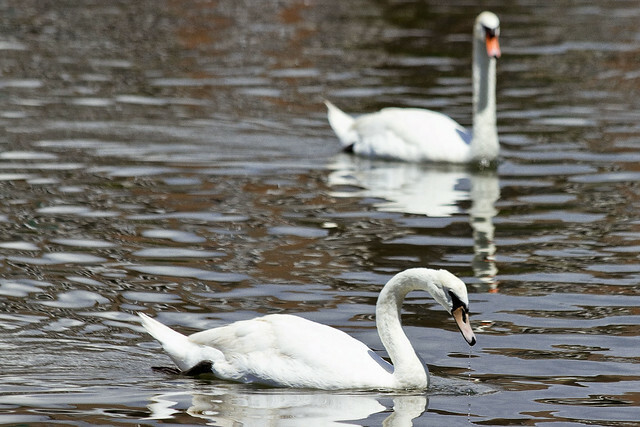 See the famous swan-related operas Lohengrin and Parsifal. The surprising diversity of life found along this waterway, which certain Government officials have referred to (in person, to me) as a “dead sea.” They’re joining the Cormorants, Great Blue Herons, Night Herons, Snowy Egrets, Ospreys, and dozens of other exotic species which have been witnessed here. Swans. The swans are the largest members of the waterfowl family Anatidae, and are among the largest flying birds. 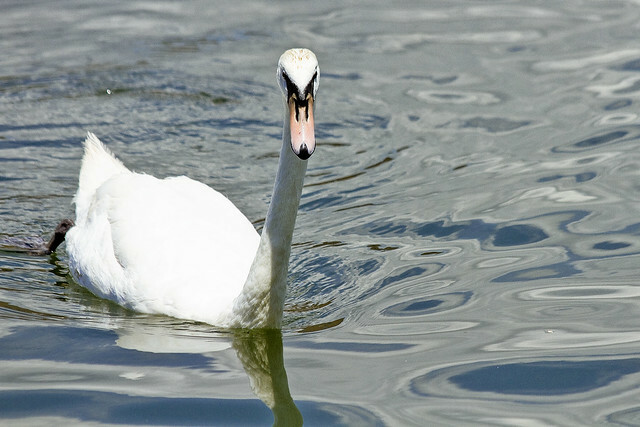 The largest species, including the mute swan, trumpeter swan, and whooper swan, can reach length of over 1.5 m (60 inches) and weigh over 15 kg (33 pounds). Their wingspans can be almost 3 m (10 ft). Compared to the closely related geese, they are much larger in size and have proportionally larger feet and necks. They also have a patch of unfeathered skin between the eyes and bill in adults. The sexes are alike in plumage, but males are generally bigger and heavier than females. Stunned by the sighting, I wasn’t paying attention when a flash of movement from within this ancient sewer caught my attention. Can’t tell you what it was, but it was big and shaggy. 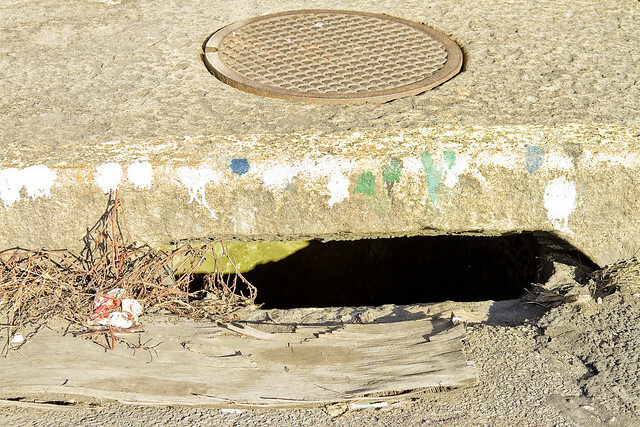 A raccoon perhaps, or an enormous rat, but an eerie sense of presence seemed to permeate the aperture. I’m probably just being paranoid, but… what if? Who can guess, all there is, that might be buried down there? The worms can survive with little oxygen by waving hemoglobin-rich tail ends to exploit all available oxygen, and can exchange carbon dioxide and oxygen through their thin skins, in a manner similar to frogs. They can also survive in areas heavily polluted with organic matter that almost no other species can endure. By forming a protective cyst and lowering its metabolic rate, T. tubifex can survive drought and food shortage. Encystment may also function in the dispersal of the worm. They usually inhabit the bottom sediments of lakes, rivers, and occasionally sewer lines and outlets. Meetup at Maspeth Creek at 1 p.m., for more information visit newtowncreekalliance.org. 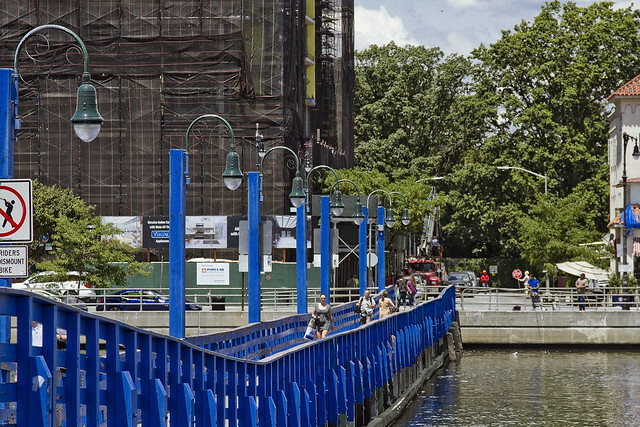 Newtown Creek walking tour with Mitch Waxman and Atlas Obscura, tickets now on sale. 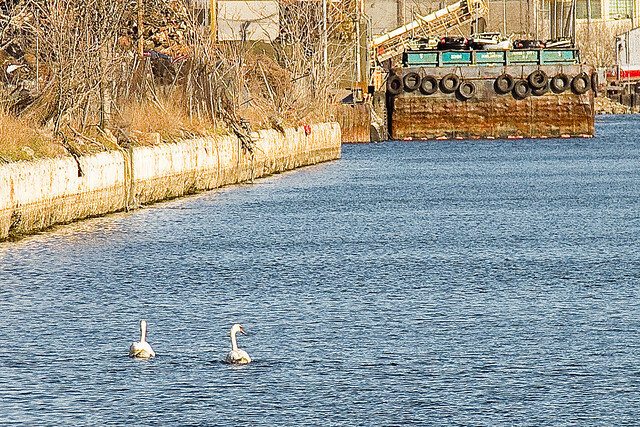 Newtown Creek walking tour with Mitch Waxman and Newtown Creek Alliance, tickets on sale soon. 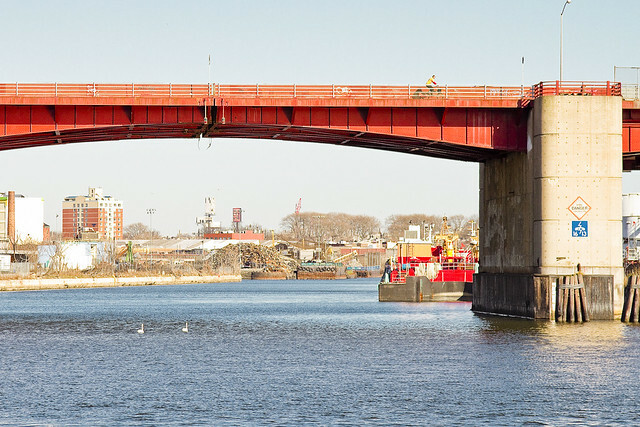 Newtown Creek walking tour with Mitch Waxman and Atlas Obscura, tickets on sale soon. Limited seating available, order advance tickets now. Group rates available.